Markets, brew pubs, water features...Vancouver's Terminal 1 aims for Pike Place livability. Many people rushing north out of Oregon on the I-5 freeway might know the space by the former Red Lion hotel and the restaurant now called Warehouse 23. The restaurant, with its thick timbers, hangs over the Columbia with commanding views and has long been a feature of the riverbank, similar to how Salty's On the Columbia is known on the Oregon side. But now, the half of the Red Lion that hasn't been demolished is a sad beige box, boarded up and protected by Flir night vision cameras and concertina wire. 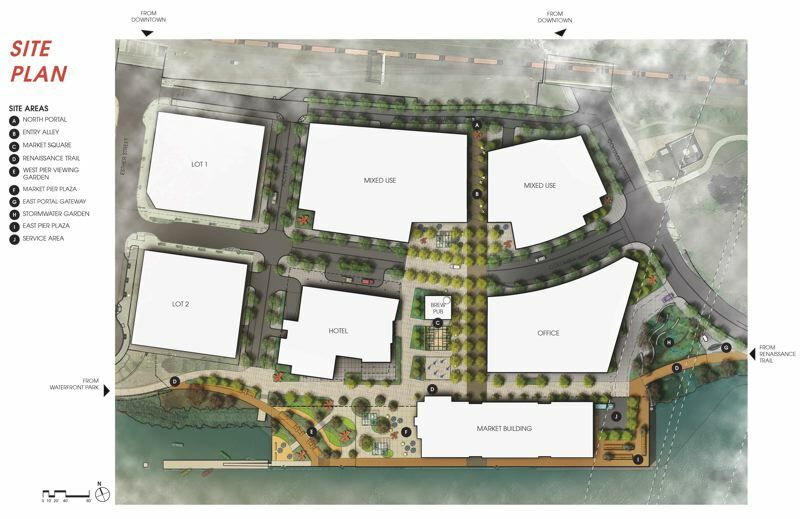 The Port of Vancouver, which owns the land, recently released plans for developing the area, adding tourist-friendly features that will boost the livability of the riverfront. The most eye-catching plans are for a public market, a mini version of Seattle's Pike Place, right in the morning shadow of the I-5 bridge. The terminal building, which was built in 1925, would be torn down and replaced with one that begins a few yards to the west. This is to keep it out of the path of any future I-5 replacement bridge. (Structures cannot be built under such roadways). The architects, Graham Baba of Seattle, plan to reuse some of the original beams that are now hidden by drywall in the restaurant The Port plans to demolish the existing dock and the wood pilings underneath it and replace it with a new dock and steel pilings. The Terminal building will be a hefty 300 feet by 100 feet. Architect Susan Tillack of Graham Baba who is working on the Terminal 1 marketplace building says the firm has done similar work at Pybus Public Market in Wenatchee, at Chophouse Row in Seattle and Melrose Market in Capitol Hill. Tillack said the Port of Vancouver staff liked that work and requested something similar. The firm is known for adaptive reuse of historic buildings. 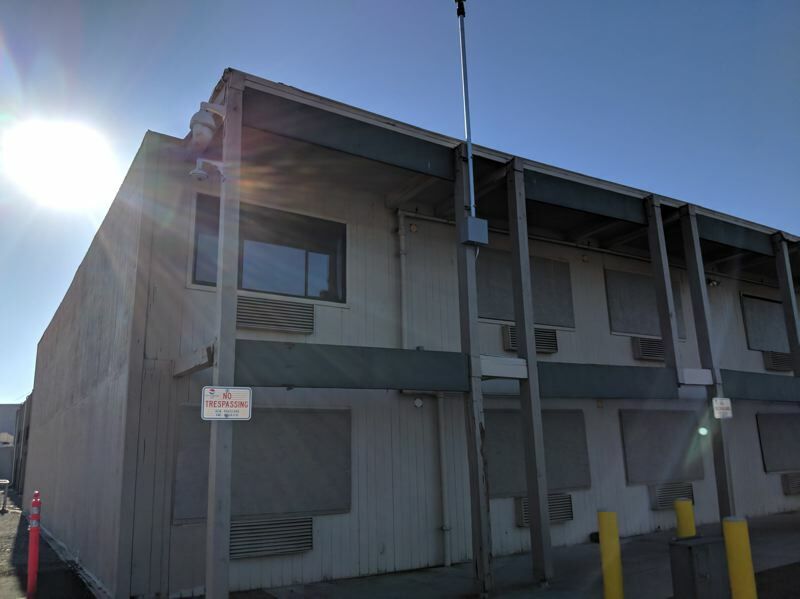 "We looked at reusing the building but because the dock is being rebuilt it would require too much to move it and put it back, the cost was not going to be worth the benefit," Tillack told the Business Tribune. Graham Baba have designed the new structure with the idea dea of re-using as much of the old timber as possible, to maintain a connection to the original building and the site's history. "It was a traditional warehouse, a basilica shape with a central bay with a high volume, and two smaller bays which allow for clerestory light coming in," says Tillack. "That's common for historic warehouses and traditional market buildings, so it's an appropriate reuse of that form." The design is for a large open volume that is flexible, allowing for restaurants and small businesses, with bays 20 feet x 24 feet, a dimension that works well for market stalls, and small businesses. 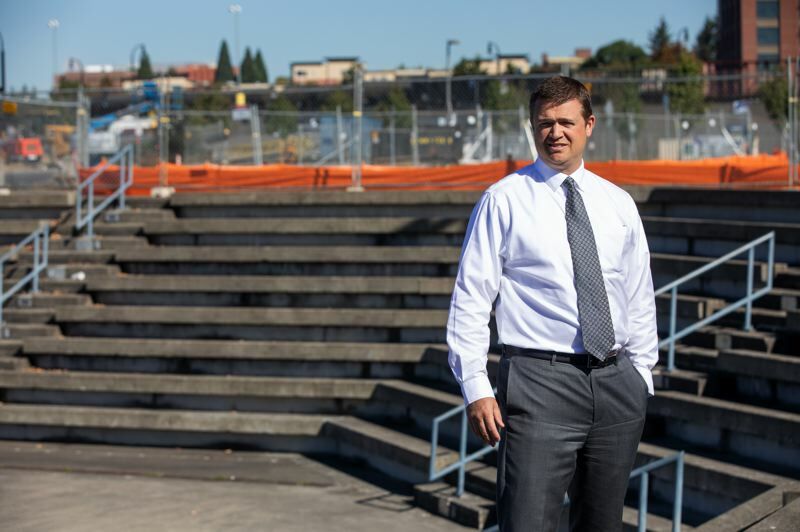 Jonathan Eder, project manager for the Terminal 1 Project, said the market won't compete with the Farmer's Market at Esther Short Park. 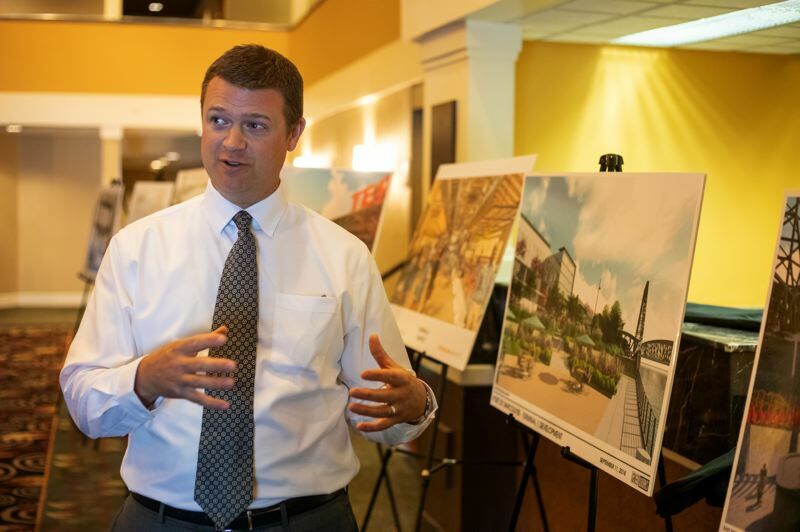 "We're trying to create a flexible space to have vendors utilize the space, restaurants, and small vendors, and if they expand they can take on more space," Eder told the Business Tribune on a tour of the space. The building will have roll-up garage doors for warm weather and day-use tables that can be cleared away for a wedding or a concert. Around the Terminal 1 market will be a public plaza space with a water feature that can be turned on and off — again like the one next to Portland Saturday market, or outside the Moda Center. The design and planning for the overall site was done by GreenWorks, a Portland-based landscape and environmental design firm. The Port has a lease agreement with Vesta Hospitality, also known as T1 Hotel, who are hoping to break ground in 2019 and build a 160 room AC Marriott on that site. The land now is flattened and fenced off awaiting the work. The strategy is for the Port to go ahead and invest in the Terminal and landscaping work, with the commitment of the hotel company. So even when there is little else there, the hotel guests would have somewhere to go, and locals and tourists would have the market and the rest of the riverfront for their entertainment. Gradually, other investors would crowd around the site, building more homes, shops and offices. The other buildings on the next blocks he calls "less well-defined" but the Port is hoping private developers will lease the land and build either offices or housing. "After about 80 years we would get those buildings back," said Eder, meaning the Port would own them. The City of Vancouver has been investing in the main street, named Columbia Way, creating a broad, attractive east-west boulevard and installing utilities for the buildings yet to come. The Port has been working in the area for 10 years, with the city and private developers like Gramor. They raised the rail line up on a berm so Esther and Grant Streets could go underneath it and connect to downtown. 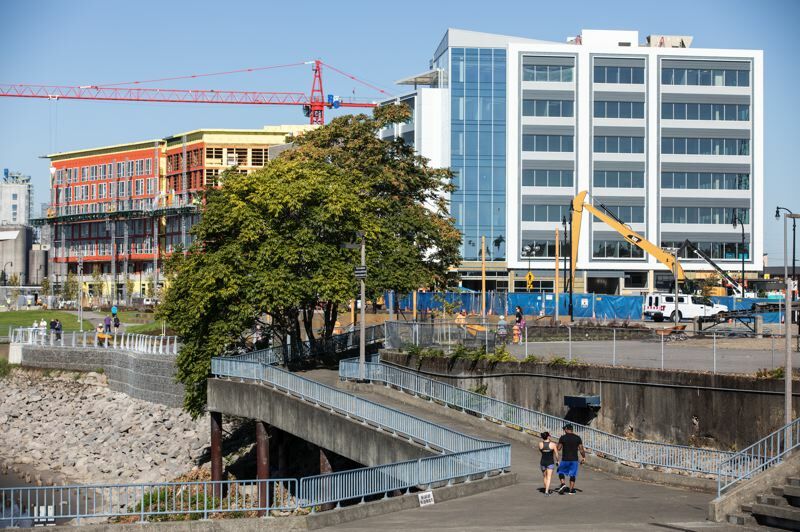 The Port leases two blocks to Gramor Development, which has been developing the area to the west toward the new Grant Street Pier and the City of Vancouver Waterfront Park. Leisure is a big feature of the new direction for this once depressing strip of land. The river boat, the American Empress, still docks at the terminal building now, by the Warehouse 23 restaurant, and will in the future, with passengers possibly staying at the new hotel. If that seems far-fetched, Abbi Russell, a spokesperson for the Port of Vancouver who accompanied Eder, said there was quite a bit of nostalgia about the old Red Lion. Apparently, before the convention center was built, it used to be one of the only places to hold an event in Vancouver: parties, big business meetings, even weddings were held there. "We had other things, like the Saddle Club, but if you weren't into that kind of rustic thing, this was it," said Russell. The Centennial Building was also a useful space, but it was torn down in 2014 so the roadway Columbia Way could come in. "It really meant something to people, and we want to honor that." Her best friend once worked in the restaurant, and it was considered a hot spot. People still come to watch the ships festooned with holiday lights before Christmas, sitting in the restaurant. The Renaissance Trail runs east under the bridge and west to Frenchmen's Park. The new development would complete that link and make it attractive. Currently joggers and walkers have to pick their way through the parking lot. 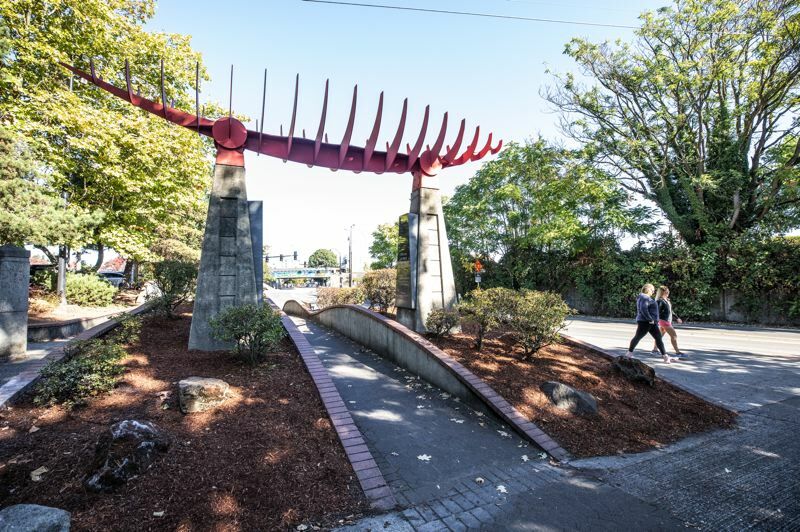 Right now there is a red metal sculpture representing a ship's frame, a monument to Captain George Vancouver, set in a maze of ramps. That area will be turned into a water treatment site. "It'll be garden-like and filter the rain before it goes into the river," says Eder. A bridge will carry the Renaissance Trail over the greenery. The architects have done 30 percent of their work and the Port has agreed on the design. That enables them to start getting costs. "The other piece is the schedule. We're going to get the costs together and then decide which part to do first. Our big lift is the dock structure which needs to be replaced, and then the marketplace building that goes on top of that is the bulk of the cost." 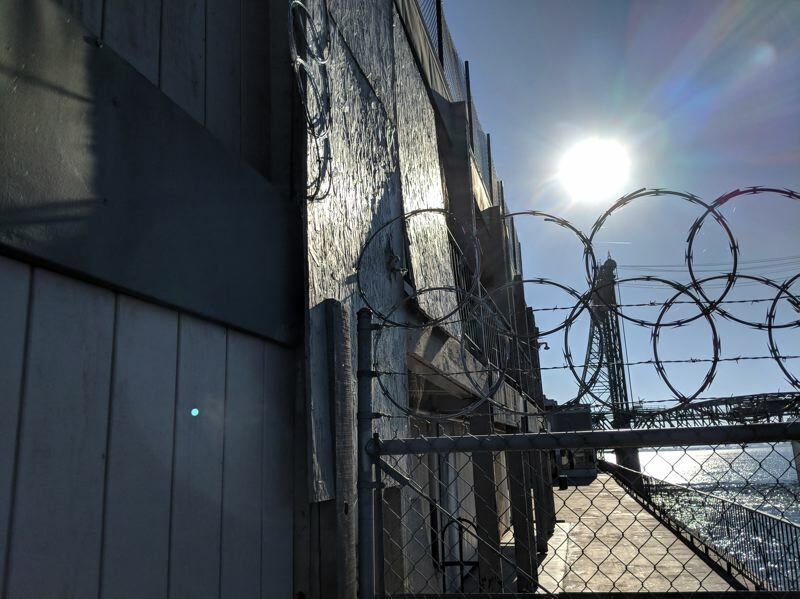 Eder says the Port has to figure out how to pay for its share of the project, either by using Port capital funds or getting state and federal grants, or funds from foundations, as well as private developers. "Our bread and butter is moving bulk products, autos, liquids, minerals, so this is a little bit out of what we would normally be involved in but it's part of our historic location and we want to be a part of this waterfront development." The proposal will go before the Port's three commissioners for a vote. "As private developers see what we're doing that will drive more interest in their being down here. People will want to be down here." He expects to break ground in 2019 and the market building and the hotel to open two years later. Replacing the dock is complicated, and time allowed for working in the water every year is limited, to reduce pollution. The Port is moving ahead but with one eye on how the new developments that are opening up a few hundred yards west will do. Does Vancouver have the appetite for more restaurants, more farmers markets, and more mixed us towers? Eder thinks so. And if a recession comes? He is confident the development will still happen, although perhaps on a different time line. Eder looks on the bright side. "It could be good for us. Construction costs go down."